In September 2018, GoPro laid off staff from Kolor, the 360 software company it acquired, and ended Kolor’s operations. It all but appeared that GoPro had its foot out the door of the 360 industry. But in an interview with PC Magazine, CEO Nick Woodman shows that GoPro intends to stay in the industry and already has plans for the future of Fusion. 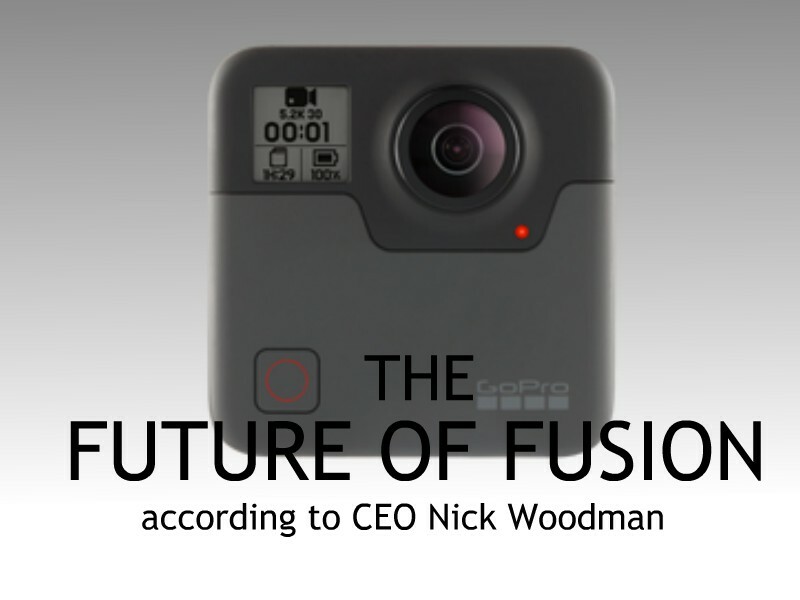 Nick said that the Fusion is just the beginning of 360 for GoPro. Nick hinted that there will be a successor to GoPro Fusion, and that it will incorporate lessons GoPro has learned from Fusion and will be very innovative. “I can’t share anything about form factor or any specifics, but what I can tell you is that since the beginning we’ve said Fusion is a development platform to get to what comes next. You should expect some pretty significant innovation in what comes next.” Nick’s mention of form factor is intriguing because it sounds like it will have a different form factor — possibly more similar to the Ricoh Theta and Insta360 One X.
Nick affirmed the usefulness of the ability to reframe video but acknowledged that it imposes more work on the user. He said that GoPro is working on making a 360 camera that is easier to use, and possibly with built-in automatic editing capabilities that may be able to produce edited footage straight out of the camera. “[Reframing Fusion footage] creates another layer of work. . . . [F]or the average consumer, eliminating that step, and allowing them to get that work done at the time of capture, is really important.” [emphasis added]. The goal would be to let the user use it as a regular camera such as a GoPro Hero and produce amazing pre-edited footage out of it. I’m glad to see Nick’s optimistic outlook on 360. I agree with Nick’s observations, particularly about overcapture as opposed to 360 photos and videos. This is not to say that 360 videos are dead — but rather they are still far ahead of their time. For most consumers, it will be more useful to use a 360 camera for overcapture. The real challenge for the 360 industry is two-fold: first is educating consumers. Few consumers understand what 360 cameras can do besides taking 360 photos and videos, and very few consumers know that 360 cameras are especially useful for non-360 videos. This challenge is reflected in 360 Rumors’ mission to educate consumers about the benefits of using 360 cameras. Second, as Nick said, we need to make 360 cameras even easier and more convenient to use for consumers who aren’t used to editing videos. Here’s the full interview at PCMag. Will be interesting to see what they come up with. As good as the One X with GoPro’s underwater specs would be a start. Sounds like he wants to make it simpler to use which means ditching the Fusion’s current high end hardware workflow. Would need a good smartphone app, but GoPro has never been about software… so I can’t see where this is going. I’m a GoPro guy having owned all the Hero cameras since the debut of the 3. Although not the Fusion. So I’m rooting for them. Competition is good for the consumer. Hey there Bill. I don’t think they’re getting rid of the current workflow. I think they just want to add an easier automatic option for casual users. Hi Svend. Indeed, the Cineform format takes much more space than H.264. But in terms of editing, from my understanding, i believe it is easier for the computer to edit cineform than h.264. However, i haven’t tried comparing cpu usage when editing. Editing fusion footage it’s extremely labor intensive, also the main reason I no longer use it. The one X is a tough act to follow but I’m glad they’re going to improve the user experience. Hi Isaac. Actually I don’t understand why people say fusion is difficult to edit. For me, the desktop app is similar to other 360 cameras, except the video is only cineform or prores. i measured the stitching time vs one x and they are almost the same on my pc. which part is most time consuming for you? and difrent videoedit aplications cannot import the stritched .mov file on Pc or Mac running the latest OS ? Hi Svend. I compared One X and Fusion on my PC, and i found the stitch time is almost the same. Yes you’re right the cineform videos sometimes can’t be played.